When surgeons remove cancerous cells from inside a person’s body, they rely on sight and feel to determine if they have gotten it all. With up to 50 percent of surgical patients experiencing a local reoccurrence of the cancer (from cells that were missed), it’s critical that doctors find and remove it all. Now researchers have discovered that an FDA-approved dye accumulates faster in cancerous cells, so injecting the dye into a patient will cause the diseased (often microscopic) cells to glow bright green under an infrared light. This innovation— not yet ready for mass use— was discovered at the University of Pennsylvania School of Veterinary Medicine (Penn Vet). 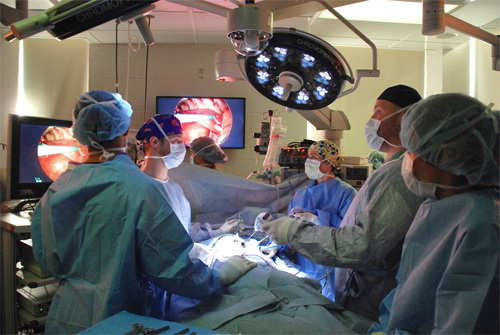 Professor of Surgery David Holt collaborated with a team at the University of Pennsylvania’s Perelman School of Medicine, led by Assistant Professor of Surgery Sunil Singhai. It’s one of many cutting-edge studies and collaborations that happen every day at Penn Vet, whose institutional mission comprises teaching, healing, and scientific investigation. 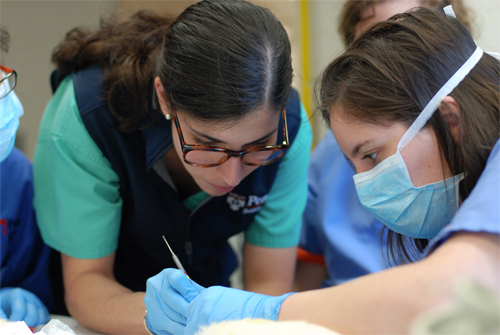 The core of Penn Vet’s teaching tradition is the relationship between animal health and human health. 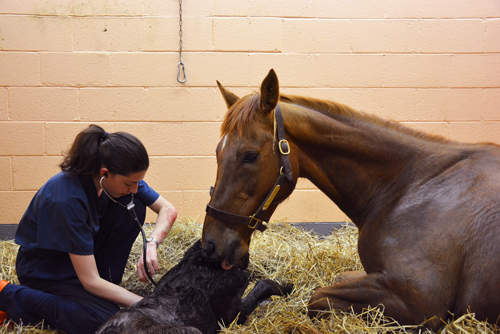 Established in 1884, Penn Vet is the only veterinary school developed in association with a medical school. The school’s research falls into four key areas: cancer, infectious disease, regenerative medicine, and neuroscience. The school is a member of the One Health Initiative, linking human, animal and environmental health. While one may think of veterinarians as the nice people who help your cat cough up a hairball or give your dog a shot, the profession is so much more, Hendricks said. For example, 70 percent of new diseases in people—like Swine Flu and Ebola—come from animals, so the medical community needs to understand these germ-spreading diseases. To that end, researchers at Penn Vet are investigating ways to reduce the spread of Ebola and other deadly infectious diseases. Penn Vet Associate Professor Ronald Harty was the senior author on two recent studies that focused on identifying and developing compounds that could reduce a virus’ ability to spread infection. Because viruses cannot reproduce on their own, they hijack host cell proteins in order to replicate, then exit the cell in a process called “budding” in order to infect other cells and spread. Harty and his colleagues focused on the budding process. They discovered molecules that reduced the virus’ ability to bud, likely reducing both the probability that an infection would grow out of control and that it would mutate to develop resistance. “By slowing down virus budding, we may allow an individual’s immune system a chance to develop a robust and a protective response,” Harty said. The next steps will be to test the compounds in animal models. 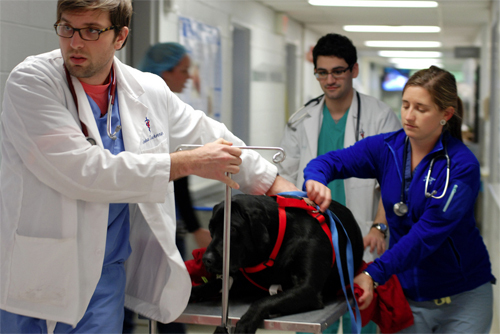 Penn Vet is the second oldest of 28 vet schools in the U.S. after Iowa State. It was proposed by Benjamin Rush in 1807 and founded with a $10,000 donation in 1884. “Taking care of animals is our moral duty,” Rush told medical students at the time. Penn Vet has two campuses, one suburban and one rural. Each has a teaching hospital with 24-hour emergency services. At the University of Pennsylvania in Philadelphia, Penn Vet runs Ryan Hospital for small animals. It handles more than 31,000 patient visits a year, including dogs, cats, less common mammals, and exotic animals such as birds, reptiles and amphibians. It also has the only minimally invasive surgery suite in a veterinary teaching hospital. In 1952, Penn Vet opened the nearly 700-acre New Bolton Center campus in Kennett Square, Pa. It’s a large-animal hospital and cares for horses and livestock/farm animals. Its Widener Hospital sees 6,000 cases annually and features the Moran Critical Care Center. Penn Vet’s Field Service—where people drive out to farms and take care of the animals—treats 36,000 patients at local farms, including horses and livestock. The New Bolton Center includes a swine center, and a working dairy and poultry unit that provides research for the agriculture industry. 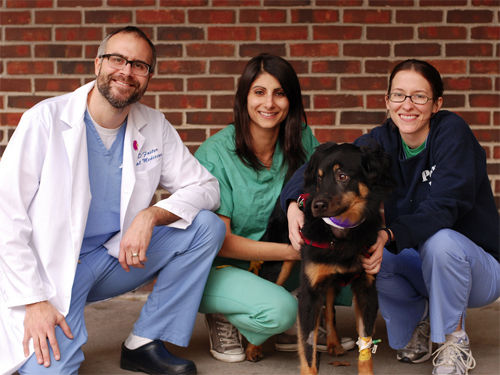 Penn Vet is competitive, receiving 1,200 applications for 125 slots a year. The school offers a V.M.D degree as well as two joint degrees— V.M.D.-Ph.D. and V.M.D.-M.B.A. Once a male-dominated field, veterinary medicine began to change after Title IX, Hendricks said. Now the field is 75-80 percent female in the U.S., with similar shifts in China and Europe, she said.